Feargal Ward’s critically acclaimed documentary has received an award for Best Documentary at the London Irish Film Awards. 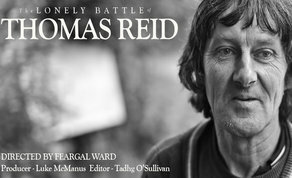 Produced by Luke McManus of FSE Films, ‘The Lonely Battle of Thomas Reid’ picked up the Best Documentary prize ahead of its special screening at the London Irish Film Festival. Set against the backdrop of the Supreme Court legal action between Kildare farmer Thomas Reid and IDA Ireland over their attempt to seize his farm for a multinational company using a CPO, ‘The Lonely Battle of Thomas Reid’ is a searching examination of the tension between a high-tech, low-tax globalised Ireland and the right of an individual citizen to continue living and working the lands of his ancestors. The film is still running in Irish cinemas, and opens in theatres in Castlebar, Donegal and Belfast over the coming weeks. It will also be running in London’s Dochouse at Curzon Bloomsbury, beginning on Saturday, November 24th with a special Q & A screening. The Lonely Battle of Thomas Reid was directed by Feargal Ward, whose debut feature Yximalloo won the Prix Premier at FID Marseille in 2014. The film was co-written, edited and sound-designed by Tadhg O’Sullivan. The film was produced by Luke McManus for FSE Films in association with Fís Eireann/Screen Ireland. For more information about the London screening or to purchase tickets – click here.